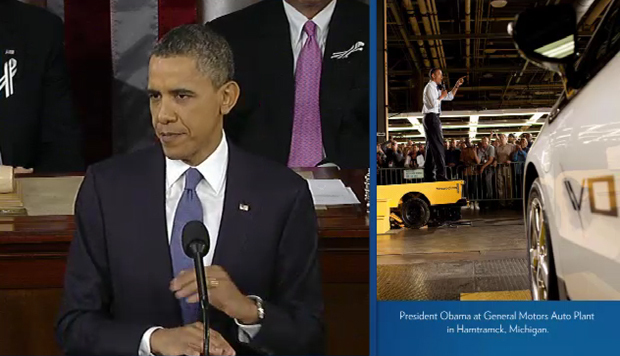 President Obama tackled a lot of ground in a short amount of time during last night’s State of the Union address. The whole thing was so fast, in fact, that it was easy to miss the many promises Obama made about clean energy and the environment. Here’s what he said–and what he left out. Right off the bat, Obama lined up some big goals: Get a million electric cars on the road by 2015, give 80% of Americans access to high-speed rail by 2035, and generate 80% of all power in the country from clean sources by 2035. The electric car and high-speed rail goals are fairly straightforward, if not overly ambitious, but Obama’s clean energy goal is a bit more complicated. Natural gas is a limited and not entirely emissions-free resource, clean coal (storing emissions from coal-fired power plants underground) hasn’t yet been proven to work on a mass scale, and nuclear power is perhaps the most expensive and hotly contested energy resource. A clean energy goal that includes two fossil fuels (natural gas and coal) is not all that ambitious. But at the same time, Obama’s inclusion of natural gas, clean coal, and nuclear energy could set the stage for a future clean energy mandate that actually gets through Congress, unlike last year’s failed energy bill. There were a few major omissions in the State of the Union. Obama didn’t mention climate change or a goal to cut down on greenhouse gas emissions. An energy bill containing cap-and-trade measures failed to pass the Senate in 2009, so we imagine that these omissions were intended to placate Republicans. It could be argued that Obama’s clean energy and innovation goals will reduce emissions anyway, but it still seems silly to work so hard to combat climate change without actually mentioning it. The SEEC is cautiously optimistic, and so are we. Let’s just hope that the President’s refusal to mention climate change doesn’t signify that the subject is about to become taboo in the highest levels of government.